Piketty’s theory is that the yield on capital usually exceeds the growth rate of the economy, and so the share of capital’s returns in national income will steadily increase, simply because interest income is growing faster than the income the whole society is getting. Let us therefore bring in the government to implement “a progressive global tax on capital” — to tax the rich. It is, he says, our only hope. Reading the book is a good opportunity to understand the latest of the leftish worries about capitalism, and to test its economic and philosophical strength. All the worries … share an underlying pessimism, whether from imperfection in the capital market or from the behavioral inadequacies of the individual consumer or from the Laws of Motion of a Capitalist System. During such a pretty good history from 1800 to the present, the economic pessimists on the left have nonetheless been subject to nightmares of terrible, terrible faults. Admittedly, such pessimism sells. For reasons I have never understood, people like to hear that the world is going to hell, and become huffy and scornful when some idiotic optimist intrudes on their pleasure. Yet pessimism has consistently been a poor guide to the modern economic world. Finally, as he candidly admits, Piketty’s own research suggests that only in the United States, the United Kingdom, and Canada has income inequality increased much, and only recently. In other words, his fears were not confirmed anywhere from 1910 to 1980; nor anywhere in the long run at any time before 1800 … The truth is that inequality goes up and down in great waves, for which we have evidence from many centuries ago down to the present, which also doesn’t figure in such a tale. The central problem with the book, however, is an ethical one. Piketty does not reflect on why inequality by itself would be bad. To be sure, it’s irritating that a super rich woman buys a $40,000 watch. The purchase is ethically objectionable. 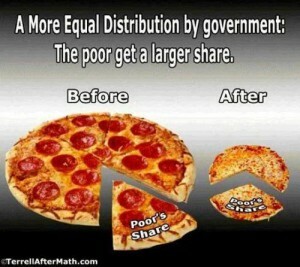 3% of a smaller pie is more than 1% of a larger pie, but the total received is smaller for the poor. The original and sustaining causes of the modern world were indeed ethical, not material. They were the widening adoption of two new ideas: the liberal economic idea of liberty for ordinary people and the democratic social idea of dignity for them. This, in turn, released human creativity from its ancient trammels. Radically creative destruction piled up ideas, such as the railways creatively destroying walking and the stage coaches, or electricity creatively destroying kerosene lighting and the hand washing of clothes, or universities creatively destroying literary ignorance and low productivity in agriculture. That even over the long run there remain some poor people does not mean the system is not working for the poor, so long as their condition is continuing to improve, as it is, and so long as the percentage of the desperately poor is heading toward zero, as it is. … It is a brave book Thomas Piketty has written. But it is mistaken.